While only a few months since his previous Congress, this next one just couldn’t wait. 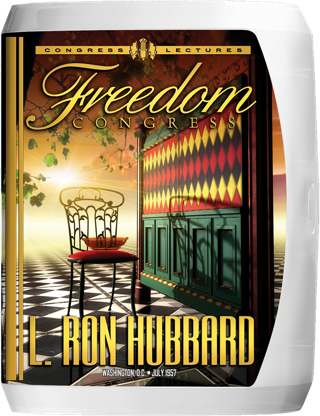 L. Ron Hubbard called it the Freedom Congress because it began on July 4th—America’s Day of Independence—and because the Congress would address freedom from human confusion. Specifically, the application of CCHs was achieving a new level of case gain. With it, a skilled auditor could process a day-old baby, a person in a coma, a total psychotic and most importantly, a person in very good shape. There was however a predicament. The effectiveness of CCHs depended on the auditor’s own case and tone level—in fact, Tone 40. How then could the processes to reach every case be applied on a broad basis if every auditor must first advance their own case to Clear? The answer revolutionized training and processing: The Upper Indoctrination Training Drills (TRs). As for what they meant to every Scientologist—far more than just teaching an auditor skill, they quite literally make a “synthetic Clear.” And that’s just the start of what you’ll hear. For when Upper Indoc hits the stage in the Freedom Congress—it hits with a bang! At the top of the Tone Scale—Tone 40—live and bullbaited! Here is not only the correct performance of these skills, but all the inherent humor in Mr. Hubbard coaching—in a Congress so lively you’ll have to remind yourself it isn’t just for entertainment! Almost at once we are going to have a Congress. So came Mr. Hubbard’s announcement in the June edition of Ability magazine. And the date couldn’t have been more appropriate. For what was about to unleash was a freedom the American Founding Fathers who signed that 1776 Declaration of Independence couldn’t have imagined. As for the urgency—“almost at once”—Mr. Hubbard had already delivered two Congresses and two Advanced Clinical Courses in the past six months. Moreover, he had only recently returned from London, where he had put the finishing touches on his latest book, All About Radiation. Yet notwithstanding the world headlines that book was generating in terms of national survival in the here and now, his radiation research had in fact yielded a far greater technical discovery for eternal salvation: Control, Communication and Havingness (CCH). “If we thought before that a person was 10 percent thetan and 90 percent body, we were probably talking about the people who drifted into Scientology. We weren’t talking about the public. So, yes, quite in addition to auditing skill, these processes in no small measure depended on the tone level of the auditor, on the state of his own case. On the one hand, it was not a new problem and the training of auditors had long included the processing of their own cases on the latest techniques. In earlier years, auditors were sometimes restimulated by the engrams of their preclear. But now, with CCH—processes so powerful they could crack any case—that auditor restimulation reached a whole new level. Moreover, as Mr. Hubbard discovered, that auditor restimulation actually prevented them from achieving results with their preclears. In fact, delivery of CCH required the auditor’s case be at a very high level—namely, Tone 40—a Clear! “It’s thirteen levels of skill, each one more advanced, which wind up with a Clear-acting auditor. That’s what L. Ron Hubbard brought to the Freedom Congress. And if the Shoreham Hotel had seen many a Scientology Congress, nothing could match this one—not when Mr. Hubbard took the stage and demonstrated Tone 40, Intention without Reservation. At which point it was something no Scientologist had seen either! Because while he had worked since 1950 to refine procedures so that every auditor could achieve the same results in their auditing, here was the milestone attainment of that goal. Then again, although Americans may have celebrated it for a few hundred years, July 4 will now be celebrated into eternity for another reason altogether. 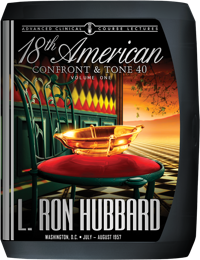 For it was the day L. Ron Hubbard provided the means to free every being of Earth.